On September 18th, 2009, New Scientist posted some striking images from the Eurographics Symposium, held in Berlin, which brought together researchers across the globe with new ideas on mapping a diversity of phenomena, from the dive profile of penguins to signature recognition systems. The one that caught my attention was the visualization of vessel movements, by Niels Willems, Huub van de Wetering, and Jarke J. van Wijk. "The sea seems an open playground, but regulations hold, and furthermore, safety (collision prevention) and security (thread prevention) need to be ensured. Operators monitor the coast using a Maritime Safety and Security (MSS) system, which allows analysis of multiple heterogeneous data sources." elucidate the authors on the problem driving their research. The goal of the project was to introduce a new visualization method to support operators of coastal surveillance systems and decision making analysts. 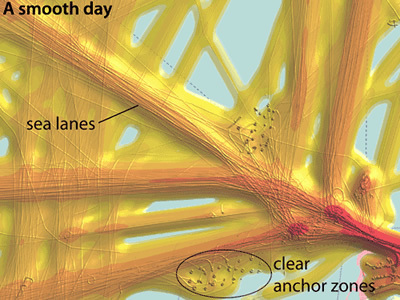 Using AIS data, the authors mapped the continuous data ships feed to coastguards to show individual traces of each vessel, where darker traces signifiy slower speeds, and colour coding shows the density of traffic in different areas. As the authors explain: "Trajectories are convolved by moving a kernel with the speed of the vessel along the path. We compute the density with both a small and large kernel and show them simultaneously in the shading of a colored height field. 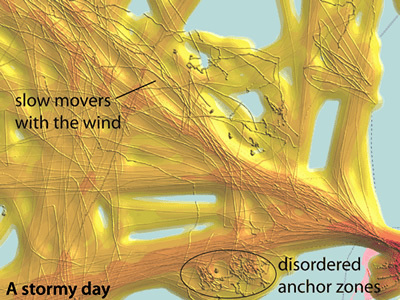 The large kernel shows an overview of maritime highways and the small kernel reveals slow moving vessels, which typically occur in zones before the harbour where ships drop anchor." The images shown here display millions of data points during one week of shipping movement, near Rotterdam, on the Netherlands coast. The first image shows the traffic landscape on a good weather day, in opposition to a more disordered layout when the weather conditions are worse - shown on the second image. You can also read the original paper (pdf).